The Spokane Region is home to nearly 250 aerospace suppliers focused primarily on airframe and aircraft interior manufacturing for the commercial aircraft aerospace industry segment. The region’s manufacturing operations are mostly Tier 3 (machined components), Tier 4 (raw materials), and Tier 2 (subassemblies) suppliers. While Boeing is by far the largest customer of regionally produced products and services, other aerospace consumers include Airbus, Embraer, Bombardier, and Gulfstream. The Spokane Region generates $1 billion in aerospace revenue and employs over 7,000 workers. The Region’s aerospace cluster is supported by low energy and labor costs, proximity to Boeing (4.5 hour via Interstate or 22 daily nonstop flights to Seattle), attractive cost of living, tremendous quality of life, and an excellent education system excellent K-12, community college, and university education system. Aerospace has been an important industry segment in the Spokane Region for over 70 years. 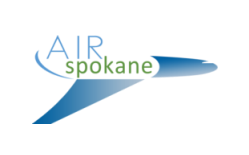 In 2012, the Spokane Region’s senior leadership from the City of Spokane, Spokane County, Avista Corp., Spokane International Airport, the Community Colleges of Spokane, and Greater Spokane Incorporated formed the Aerospace Initiative for Recruitment (AIR) Spokane. Its singular mission is to focus on recruitment, retention and expansion of the aerospace industry segment. AIR Spokane has assembled a tiered incentive package for infrastructure extension and workforce training, and a commitment for fast-track permitting. Spokane International Airport’s commercial airline service, established physical infrastructure, and 7,000-acres of land play an integral role in the AIR Spokane initiative. Spokane is served by Alaska, American, Delta, Frontier, Southwest, and United, as well as, cargo carriers FedEx and UPS. The passenger carriers provide nonstop service to 10 major commercial centers on 50 daily departures and 5,000 seats. The nation’s 8 largest rental car companies have on-airport facilities. The Airport’s main runway is served by an all-weather Category III Instrument Land System allowing for precision landings in low visibility conditions. The Airport has no residential encroachment or flight restrictive curfews, which allows for 24-hour operations. This is particularly important for the airfield’s existing aircraft maintenance companies and to prospective Maintenance, Repair and Overhaul (MRO) operators. The Airport’s property is immediately adjacent to Interstate 90 and access provided by 4 interchanges. High-capacity utilities including sanitary sewer, water, natural gas, electricity, and high-pressure steam heat are available. In addition to air and surface transportation, rail service is also available on the property west of the Terminal building. Property can be leased on a long-term basis (up to 50 years) or purchased. Through the AIR Spokane partners, facilities can be built-to-suit or privately financed and constructed.